The Nitrogen Cycle is one of our planet's most important nutrient or biogeochemical cycles. Why? Because nitrogen is an essential building block of all the amino acids which make up proteins, and is a critical element of the nucleic acids, DNA and RNA. In short, without nitrogen life as we know it is impossible. There is no shortage of the element nitrogen here, it makes up 78-79% of our atmosphere. The atmosphere's nitrogen, N2, has a very strong triple bond between the two atoms. Under normal conditions it won't react with anything and it can't be used by either plants or animals. For plants to be able to make use of the nitrogen they need the bond broken and recombined as either ammonia NH3 or NH4 or nitrate NO3. This process is called fixing or nitrogen fixation. As plants need fixed nitrogen and we rely either directly, by eating plants, or indirectly, by eating animals that have eaten plants, on them for our lives, fixed nitrogen is critical to life. Fixed or biologically available nitrogen is often the limiting factor for growth in an ecosystem or garden. 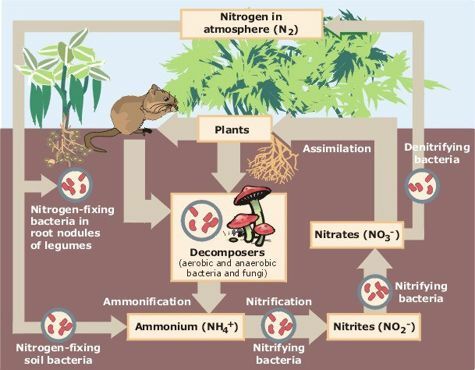 Bacteria's Role in the Nitrogen Cycle. The vast majority of the movement of fixed nitrogen is handled by bacteria. There is an intricate web of these bacteria in the soil. This diagram, compiled by the USDA shows some of the flows of fixed and unfixed nitrogen in the soil. Decomposer bacteria keep the fixed nitrogen in the system. Roughly 1,200 million tons of fixed nitrogen is cycled back and forth through cycles of growth and decay in plants and animals. Because fixed nitrogen is often the limiting nutrient in an ecosystem nature carefully recycles this nutrient through the decomposers. The compost process of decomposition is essentially the same thing - a way to breakdown the nutrients and keep them available in a plant friendly form. Nitrogen fixing bacteria are able to fix nitrogen by breaking apart the triple N bond and recombining it to make plant friendly compounds such as ammonia or nitrates. They fix around 120 million tons of nitrogen per year. Another important group of bacteria denitrify the fixed nitrogen releasing it back as N2 gas. The denitrifiers keep the whole system in balance. Roughly the same amount of nitrogen is fixed and then unfixed in the natural system. These bacteria are vital to the life cyle of the planet. Many live in a symbiotic relationship with plants. The most well known pairing are rhizobia bacteria with legumes plants. Indeed, agriculture's deliberate growing of legume crops contributes to some extent to the amount of nitrogen fixed throughout a year. Another natural path for nitrogen fixing, one that's missing in the USDA diagram, is that of lightning. According to the National Severe Storms Laboratory lightning can have between 100 million to a billion volts and contains billions of watts. It superheats the air to temperatures up to 60,000 degrees F in a matter of a few millionths of a second. This super heating causes very high pressures to develop (in fact the pressure is what causes thunder). The tremendous pressures and energy of a lightning flash is sufficient to break apart the triple nitrogen bond. The released atoms are then free to bond with the hydrogen and oxygen atoms in the water - rain - and they fall as mild nitrate and ammonium fertilizers. While scientists argue about the extent of nitrogen fixed it's worth noting that lightning strikes somewhere on the planet an average of 3 million times a day. Most scientists figure that 10 to 20 million tons of N is fixed this way. Likely the first lifeforms relied on lightning as their source of the nitrogen building blocks. Currently we, using an energy intensive process, now manage to fix around 100 million tons of nitrogen a year 80 million tons of which is used in fertilizer. The Haber process, developed by Fritz Haber in 1909, has had epic impacts on the planet. On the plus side we can produce more food and so have a huge increase in human population. On the minus much of the fertilizer we apply ends up not in crops but in the ocean where nitrogen levels are the chief cause of the ocean's dead zones. We've yet to master balance. We fix 100 million tons of nitrogen but as yet have nothing balancing the equation. In other words we might be overwhelming the Nitrogen Cycle on the planet. Nitrogen Fixing Bacteria - Natures way of fixing nitrogen. Decomposer Bacteria - Another way nature keeps nitrogen available for plants - your compost works here. The Haber Proccess - Man's way of making plant available nitrogen.